Just remember, if somebody tries to give you or your kids an eyeball on Halloween...take it, cause that's the good stuff. 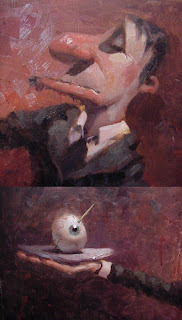 And this is oil on board, for those wondering. Edit: Now with detail shots. Still hammering away. These are both 2 hour studies. We've all heard the saying "get your values right, and it doesn't matter what colour you use." With the painting of the girl at the top, I decided to use the worst possible combination of colours on my palette (Burnt Sienna, Prussian Blue, and White), but still have a full value range. I simply ignored the somewhat ugly colours that were going down, and just tried to get the values correct. 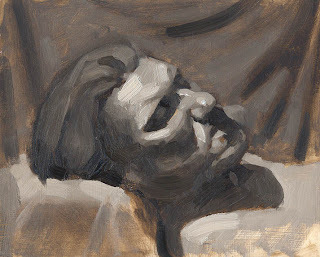 The bottom painting is a good ol' Raw Umber+ White study. Last year I saw a "Post No Bills" notice written on a wall. And just underneath it, somebody posted pictures of Bill Clinton, Bill Gates, and Bill Murray. It's the first time I'd seen that joke, and I thought it was genious. 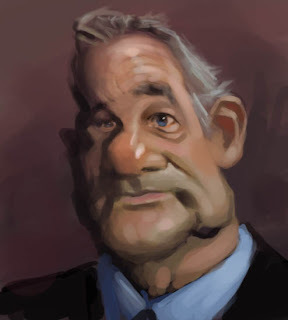 Anyway, here's a little lunchtime Bill Murray speed sketch. 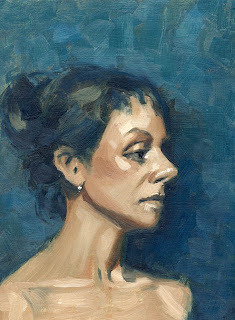 Thanks to a well-timed note from Mark, I re-discovered the work of Milt Kobayashi. 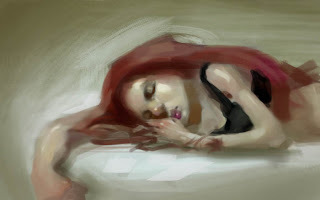 This meager little sketch is shamelessly inspired by his simplicity and (odd) colour sense. Good use of work downtime, anyway.